Located on the ground floor of the new Thompson Hotel, Scout manages to avoid the dull-hotel-restaurant trap and take some risks. Most hotel restaurants stick to the beaten path. Few risk going off trail. Scout not only dares to do that, it does it well. Scout just may be the defining Seattle restaurant of the moment. The luxuriously arch décor pokes fun at the city’s sartorial clichés. The dual concept — an intimate, exclusive dining “experience” embedded within a traditional restaurant — caters to the growing dichotomy in our population and makes Scout attractive to the haves, but still accessible to the have-less. You’ll eat extremely well no matter which way you go. Scout’s base camp is on the ground floor of the new Thompson Hotel at First and Stewart. 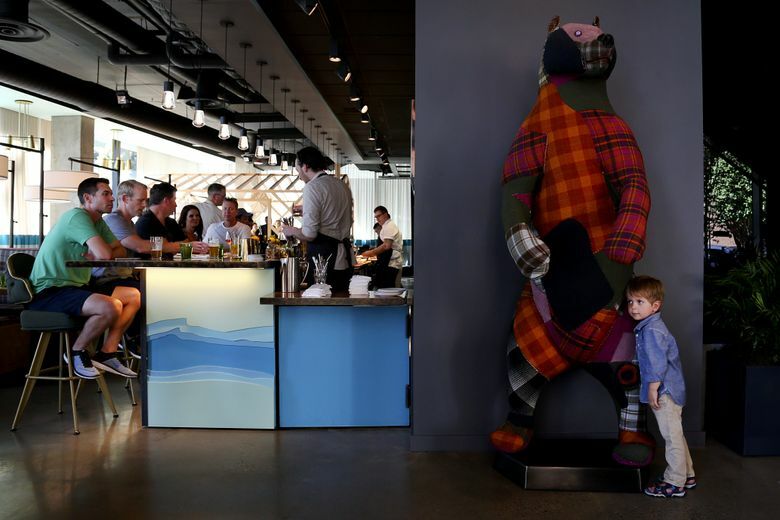 A giant stuffed bear upholstered in plaid flannel towers over the entrance, coordinating with the dining room’s cushioned benches and even the hostesses, whose uniforms are bold black-and-white checked skirts and denim blouses. From a wing chair in Scout’s lounge you might glimpse the Sound, though the truly heart-stopping view is from The Nest, a cocktail lounge 12 floors above. Both venues were conceived by the Huxley Wallace Collective (Westward, Quality Athletics and more) led by chef/entrepreneur Josh Henderson. The Chef’s Counter is where the elite vie to eat. 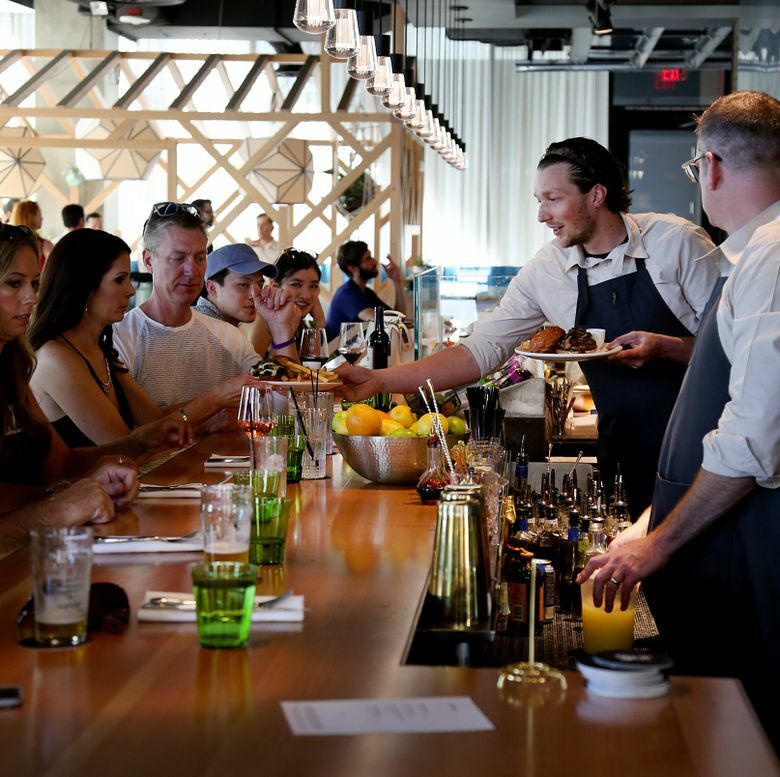 It’s an extension of the bar with eight plush, tufted swivel seats overlooking a kitchen line devoted solely to a fixed-price menu of more than a dozen courses. There is one seating, five nights a week. Tickets are sold online. The price per person — $120 plus tax and a 20 percent service charge — is nonrefundable, but transferable. Drinks are extra. 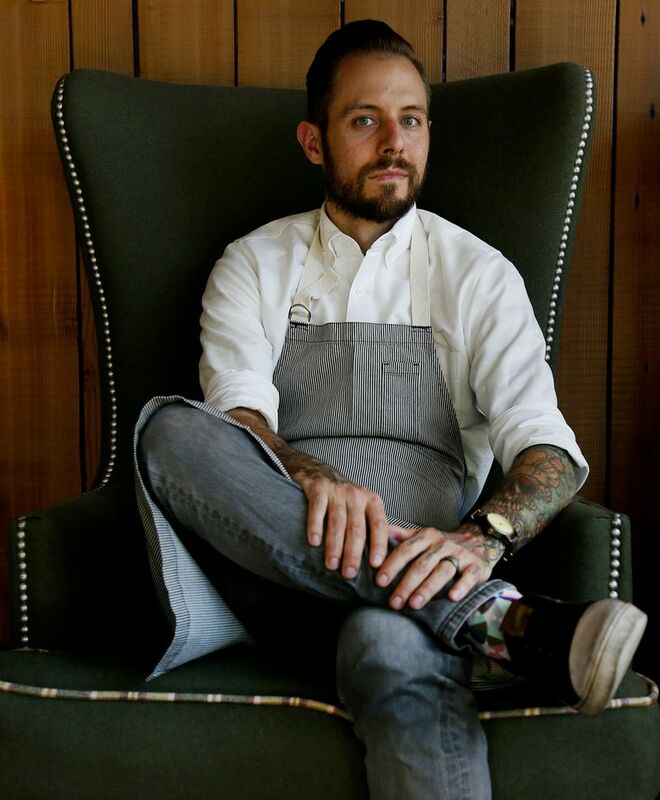 Executive Chef Derek Simcik is no stranger to hotel kitchens, having risen through the ranks of Kimpton Hotel restaurants in Washington, D.C., Chicago and Santa Barbara. He’s adept at turning humble into haute. His clam chowder resembles a velvety bisque. Exquisitely tender pork cheeks basked in a powerful bordelaise sauce. 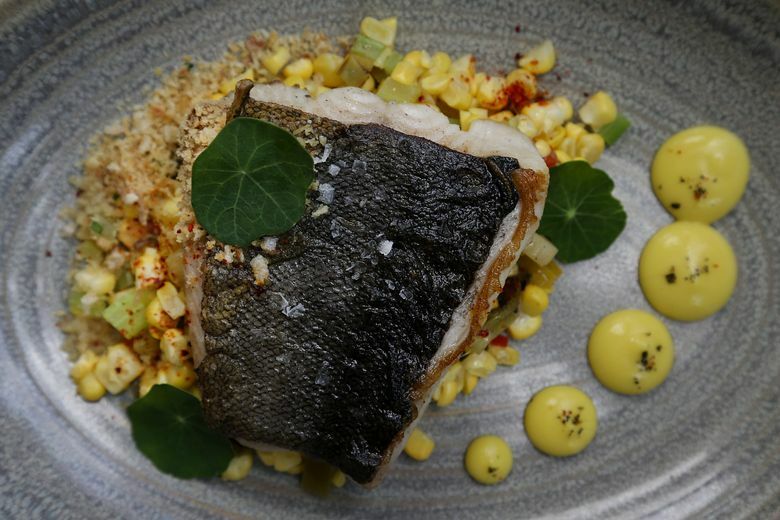 Pan-seared rockfish came with a creamy jumble of fresh corn, white beans, finely diced aromatics and toasted cornbread crumbs — an ensemble that seemed far too sophisticated to be called succotash. Mac and cheese is wonderfully re-imagined with house-made torchiette, large, floppy noodles that in the server’s words, “look as if the tube and the spiral had a baby.” A sauce of Parmesan-infused buttermilk, with chopped, pickled garlic scapes for added tang, fill their capacious nooks and crannies. At lunch, labneh, lots of fresh mint and the sweet crunch of sunflower-seed brittle tamed the heat of harissa swaddling soft, charred carrots. 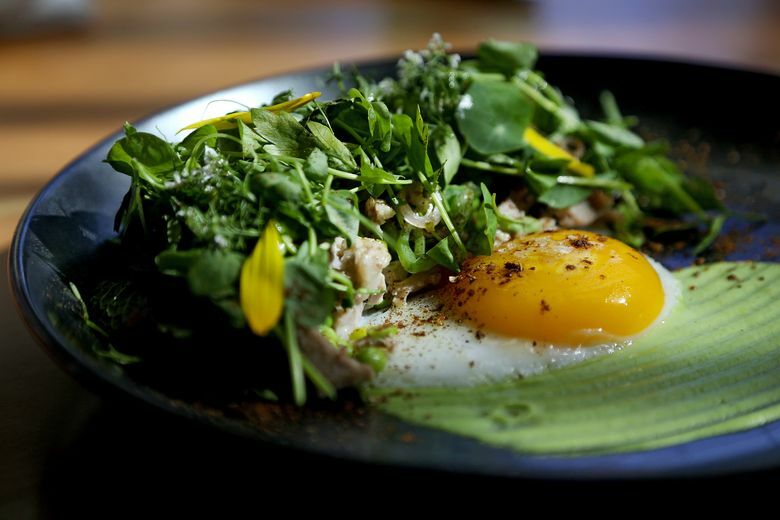 A warm blend of Chinese spices dusted the sunny-side up duck egg served with crackling slivers of classic duck confit and green pea crema — an escalation of richness offset by fresh peas and pea vines. A superb hangar steak, grilled rare and thickly sliced, anchored a Thai beef salad crunchy with pickled vegetables and lavished with lime and fish sauce. Only one dish went off the rails. Grilled asparagus with morels was doused tableside with dashi broth that extinguished much of its nuance and did no favors for fingerling potato chips that rapidly went soggy. Pastry chef Kate Sigel’s desserts were hit or miss: a chocolate tart with a soft crust and rubbery cherries disappointed, but a meringue-embellished almond tart filled with lemon and blackberry dazzled. For adventurous epicures with the wherewithal, the chef’s counter feels like a relaxed dinner party. Chef Quinton Stewart and sous chef Jon Green guide a gastronomic ramble from seashore to forest to field with palpable excitement for the ingredients at hand: the sea palm that speckles yellowtail poke; the local grains that anchor a lovely asparagus and porcini porridge; the foie gras, glazed with birch syrup and skewered with fresh peach, that comes from ducks raised in Puyallup. Fresh diver scallops had shown up unexpectedly that afternoon and were put to good use. Served raw, thinly sliced and adorned with bits of mandarin orange, mint and a tiny pink petal of roe, they joined that night’s menu, part of an iced platter that also included the poke, a lone kusshi oyster anointed with nuoc cham, geoduck sashimi with finely chopped daikon and grilled ramps, and a spoonful of cauliflower cream studded with golden char roe. This stellar opening act unfolded at tables in the hotel’s open air atrium, where our appetites had been primed by Martinique rum daiquiris mixed tableside. After that we proceeded to the counter, where Stewart handed over the evening’s most sensational single bite — tempura-fried geoduck belly with nori powder and oyster mayonnaise. I could have eaten 10. But that wouldn’t have left room for lamb tartare dappled with mint pistou; for peeled Sun Gold tomatoes nestled in stracciatella, cream-soaked strands of fresh mozzarella; for airy focaccia dotted with nuggets of porchetta and fresh zucchini blossoms; or for steelhead, smoked over apple wood while we ate. The smoked fish would land next to beets, dill crème fraîche and the teeniest blini imaginable. In a regular kitchen, “nobody gets to see this part, and it’s the best part, sharing it” he says, while deftly transferring two massive New York steaks from skillet to platter, releasing the tantalizing aromas of the herbs, garlic, vinegar and brown butter in the pan juices. The meat was good but the accompaniments shined brighter: corn three ways, a crisply caramelized cipollini, and tiny chanterelles in an intense brown sauce heady with herbs. Sensing the enthusiasm, Stewart walked around the counter to dole out second helpings of the mushrooms. For dessert, guests are whisked upstairs to The Nest, bypassing the gatekeeper in the lobby. It was almost twilight when we settled at a window table. The chefs passed delicate sour cherry tartlets, poured hot chocolate over a swirl of chartreuse-laced Bavarian cream, and said good night. We settled our beverage tabs. Scout’s wine list is pricey by the bottle or glass so it’s worth getting the well-chosen wine pairings ($85 plus tax and service charge). Some ordered cocktails ($15 each). I pinged the valet for my car ($25). There was no surcharge for gazing at the crescent moon pinned to the purple sky above the Olympics as long as we wanted.